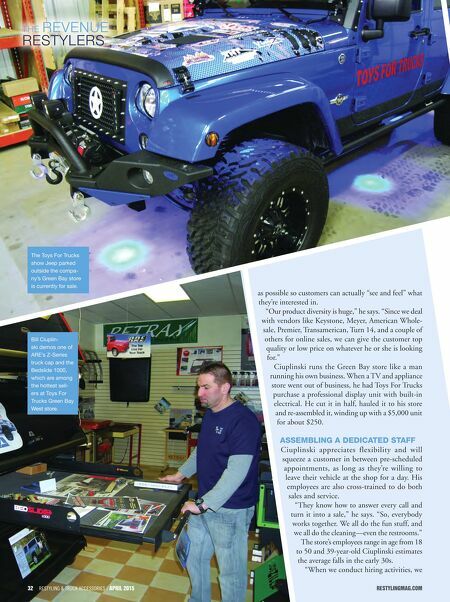 32 Restyling & tRuck AccessoRies | April 2015 restylingmag.com as possible so customers can actually "see and feel" what they're interested in. "Our product diversity is huge," he says. "Since we deal with vendors like Keystone, Meyer, American Whole- sale, Premier, Transamerican, Turn 14, and a couple of others for online sales, we can give the customer top quality or low price on whatever he or she is looking for." Ciuplinski runs the Green Bay store like a man running his own business. When a TV and appliance store went out of business, he had Toys For Trucks purchase a professional display unit with built-in electrical. He cut it in half, hauled it to his store and re-assembled it, winding up with a $5,000 unit for about $250. Assembling A DeDicAteD stAff Ciuplinski appreciates flexibility and will squeeze a customer in between pre-scheduled appointments, as long as they're willing to leave their vehicle at the shop for a day. His employees are also cross-trained to do both sales and service. "They know how to answer every call and turn it into a sale," he says. "So, everybody works together. We all do the fun stuff, and we all do the cleaning—even the restrooms." The store's employees range in age from 18 to 50 and 39-year-old Ciuplinski estimates the average falls in the early 30s. 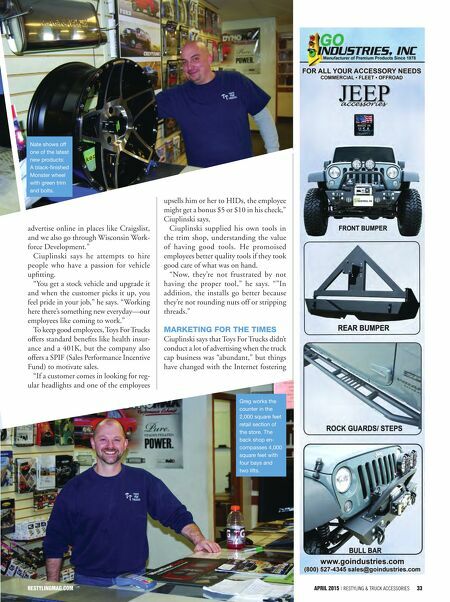 "When we conduct hiring activities, we 32 Restyling & tRuck AccessoRies | April 2015 The Revenue ResTyleRs The Toys For Trucks show Jeep parked outside the compa- ny's Green Bay store is currently for sale. Bill Ciuplin- ski demos one of ARE's Z-Series truck cap and the Bedslide 1000, which are among the hottest sell- ers at Toys For Trucks Green Bay West store.